Applying for a job in the US? There are a number of differences in the hiring process between the US and most other countries. These differences start with the cover letter and resume, and extend to the interview and even the negotiation process. If you’re not from the US, or are unfamiliar with the way job searching works here, these differences can be tough to navigate. In this article, we’ll talk about the American Resume, how to write it, and what to include to make sure your resume stands out from the pack. What’s the difference between an American Resume and Your Current CV? An American resume generally does not include any personal information beyond name and contact information. This extends to marital status, age, number of children, and other personal details. It’s actually illegal for employers to ask for this information during an interview, and it would be considered pretty out of the ordinary to volunteer it in your resume. While CVs elsewhere can be 2+ pages, in general it’s common practice to keep your resume to 1 page in the US, unless you are an experienced candidate with a lot of relevant job experience and job switches, or you are applying for a more technical position that requires you to list your qualifications/projects in your field of specialization. Unless you are currently in high school or university, or do not have any further education beyond high school, its best to leave off high school information on an American resume, and use that space on other information more relevant to the job you’re applying for. 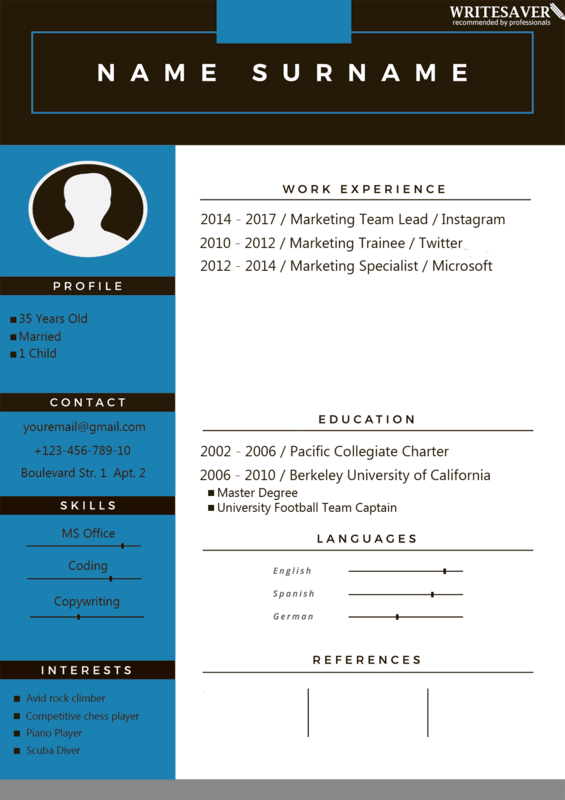 While you may have a ‘template’ for your American-style resume and cover letter, this template should be customized for the job you are applying to. The most relevant jobs should be talked more about, whereas less relevant information should be shortened. Relevant academic projects should be highlighted, where less relevant ones should be removed. In general recruiters spend very little time looking at every resume, so you want to make sure every piece of information shows why you would be a great candidate to fill the job they want to fill! Now that you know some differences between a US resume and a CV in other parts of the world, we’ll get into what your resume should actually include! This varies a little based on how much job experience you have, how recently you completed your education, and what you want to most emphasize when recruiters are looking at your resume. This is the section to include your name and contact information. It’s standard practice to include your address, phone number, and email address in addition to your name. These may include fraternities/sororities, organizations relevant to your course of study, honors organizations, and other similar organizations. If you want to include their names in a single bullet point these fit well here, but if you held a leadership position you’d like to further discuss (such as President of a university organization), you may want to wait for the Job Experience section to do so. The Education section can come either before or after the Job Experience section, depending on how recently you graduated and what you most want to bring the resume reader’s attention to. In general, put the items you want the most attention drawn to at the top! What you accomplished on the job (e.g. a marketing manager might say “Lead changes that contributed to a 50% increase in marketing spend ROI”). This lets the hiring manager know what you accomplished. If you have a relevant side project, or completed a relevant group project while in school you’d like to discuss, this is the place to do it! This is by no means a comprehensive list, so feel free to include anything you think is relevant! This section should also be customized to be highly relevant to the job you’re applying for. This section isn’t necessary, but it may help your interviewer get an idea of who you are as a person and help spark a conversation if you hold a common interest. Remember, in addition to evaluating your technical qualifications, your interviewer wants to know how you’ll fit into the company and what you’ll be like to work with, and it’s a hard job to evaluate all that during the span of a short interview! So if you have space for it, this section definitely won’t hurt, but if you don’t, and your resume is full of highly relevant information about your qualifications for the job, don’t worry about adding it. If you do decide to include it, it shouldn’t take up more than 2 lines of text, and generally only uses 1 line to briefly list your interests. An exception to this would be if you have an interest/interests that have led to exceptional accomplishments (e.g. Avid rock climber (climbed Mt. Everest in 2014), competitive chess player (rated top 10 in the world), enjoy surfing (won the Pipe Masters Pro Competition). These types of ‘interests’ allow you to show your dedication, hard work, and passion towards your hobbies, all of which can be applied to your new job! Hopefully you now have a better idea of what goes into an American resume, and how to write one! As you can see, where you put each item on your resume depends heavily on you and your situation, and what jobs you are applying to. As such, remember the overarching rule is to make your resume relevant to the job you’re applying to, and format it in a way that highlights your most relevant accomplishments! Have resume questions not covered here? Post them in the comments!